Mormon Tablets: Were they iPads or Microsoft Surfaces? Thanks to the Tony Award-winning musical, “The Book of Mormon”, the number of Americans acquainted with the religion of Mormonism is higher than ever. Mormons, who are members of the Church of Jesus Christ and the Latter Day Saints, believe in a third installment of the Bible, that was discovered in the backyard of All-American Prophet Joseph Smith. This third testament is said to have been inscribed on golden tablets- in many ways like a newer, flashier version of those given to Moses. And so, with Microsoft’s newest promotion, in which they promise to exchange gently used iPads for their own product, the Microsoft Surface, the question arises, were Joseph Smith’s tablets iPads or Surfaces? The price disparity between Moses’ and Smith’s tablets, implied in the characterization of the latter as “golden” and the former as merely “stone” would suggest that Smith uncovered a set of early-release iPads. Yet Moses was such an early adopter of the tablet technology, it is unclear whether the Surface had even come to market yet. The answer becomes clearer when one analyzes the contents of the tablets. Moses’ famously contained ten discrete commandments, heavily suggesting that they were iPads, which notoriously can have only one application open at a time. Smith’s, on the other hand, told a story, requiring a diverse audio-visual experience and GoldenGlasses™ security- only a Surface, with its ability to open multiple windows at once, could provide that. 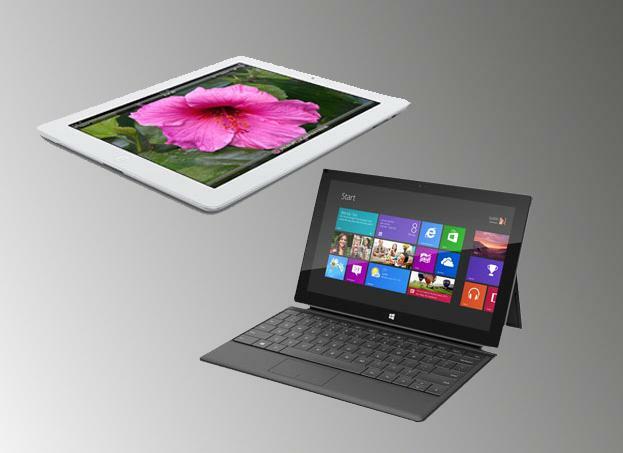 In this light, Microsoft’s offer poses challenging theological questions: Who will trade in an iPad for a Surface? Who will convert? Can people convert after death? Can iPads be exchanged after their owner’s passing? All in all, the jury is still out on which company’s tablets were referred to in the Old Testament versus the Book of Mormon. Either way, whichever religion gets stuck with the Surface is not on the path to salvation.